In a small bowl, combine the soy sauce, sugar, red-pepper flakes, and broth. Sprinkle the fish with the salt and black pepper. Heat the cooking oil in a large frying pan over moderately high heat. Add the tuna and cook until brown, about 3 minutes. Turn and cook the fish until done to your taste, 3 to 4 minutes longer for medium rare. Reduce the heat to moderately low and put the sesame oil in the pan. Stir in the scallion and garlic and cook, stirring, for 1 minute. Add the soy-sauce mixture; simmer until reduced to approximately 1/3 cup, about 2 minutes. Cut the tuna into slices and serve with the sauce. Fish Alternatives Salmon fillets or steaks will also go well with this highly seasoned sauce. 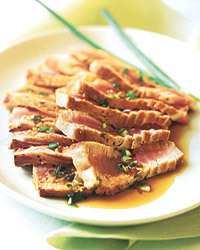 Test-Kitchen Tip We like fresh tuna cooked to a succulent medium rare. If you prefer your tuna cooked through, just add a few more minutes to the cooking time. Be careful not to overcook it, though, or it will most assuredly be dry. An aromatic white wine with just a touch of residual sweetness will buffer the spiciness of this dish and balance the saltiness from the soy sauce. Try a luscious Sauvignon Blanc from New Zealand or California.